Wayne Mutual Insurance Company provides property and casualty insurance for autos, homes, farms and businesses. We also offer umbrella liability programs and other policyholder services through ongoing company partnerships. Wayne Mutual was founded in 1910 by a group of Wayne County farmers who wanted to insure their homes and barns against loss. 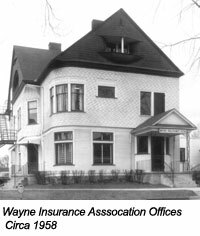 Known as the Wayne Insurance Association, the new organization required subscribers to have their buildings “well rodded with approved rods.” Members were not charged a premium, but were assessed at the end of each year for an amount sufficient to cover whatever actual losses had occurred. The company's first office was in the home of J. Stewart McCoy, a farmer living near Wooster, who was also one of the company's founders. In 1924, the company opened an office in the People’s Federal Building in Wooster. At that time, the company’s management was assumed by J. Stewart McCoy’s son, Grover. With his descendant Elizabeth McCoy having served on the company’s board of directors and her son Matthew McCoy being an independent agent, the McCoy family has been closely involved with Wayne Mutual through five generations, spanning the company's first century of operation. In 1949, management of the company was entrusted to D.M. Langell, an association board member. In 1952, the company moved from its offices in the People's Federal Building to a converted home at 220 N. Market Street in Wooster. In 1962, Ralph Gresser, a former dairy farmer from Smithville, Ohio, was appointed Secretary-Treasurer, and in 1963 the company reorganized from an assessment mutual into an advance premium mutual. The company name was officially changed to Wayne Mutual Insurance Company at that time. 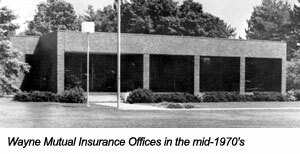 In 1973, Wayne Mutual opened a new office at 3873 Cleveland Road in Wooster and operates at that address today. In 1987, Wayne Mutual again reorganized and Ralph Gresser was appointed as the new company president. Mr. Gresser retired as president in 1996 but continued to serve on the company's board of directors until 2011. Tod J. Carmony, whose father Lloyd Carmony served as the president of the board of directors from 1963 to 1970, was named president and chief executive officer of the company. Wayne Mutual is proud of its heritage of providing financial security and peace of mind for its policyholders. 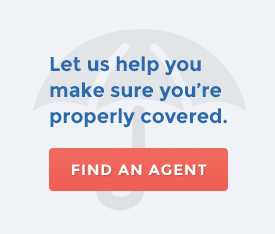 As new challenges have emerged, and as policyholder needs have changed, the company has adapted to maintain the highest level of insurance coverage.